Suntrust Bank Routing Number along with account number is required to set up a direct deposit, receive funds through wire transfers or to complete an automated money transfer. You can also locate the Suntrust Routing Number on your checking, savings or business account check book issued to you by your bank branch. 1: Financial Institution Routing Transit Number: 9 numbers located between two symbols. This number identifies the bank holding your account and check processing center. 2: Account Number: This is your complete account number (excluding spaces and special characters). If you have more than one account, each account will have a separate number which may not be in sequence. Your personal SunTrust account number may be up to 13 digits. 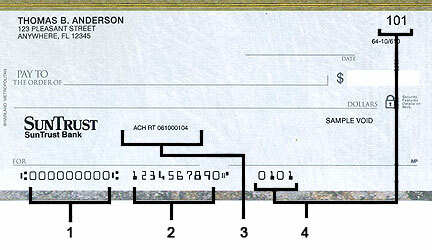 4: Check Number: Each time you write a check, even for an electronic payment by phone, you should use the next available number in sequence and be sure to record the necessary information in your checkbook.